There’s a reason we come back to the same grocery store each week. It’s the same reason that we return to the same barber, home improvement store, or favorite restaurant. These businesses have created a positive experience, which in turn creates loyalty toward their particular brand. In the retail world, brand experience and engagement are the strongest drivers of loyalty, and the digital world is no different. Design, atmosphere, speed, and problem resolution are all pillars of a great consumer experience, and these same concepts contribute to their digital experience as well . A great user experience on your site ensures that your visitors can find everything they’re looking for with ease and speed. It’s up to you to create a content-rich, meaningfully designed site that keeps your customers and partners engaged and returning for more. 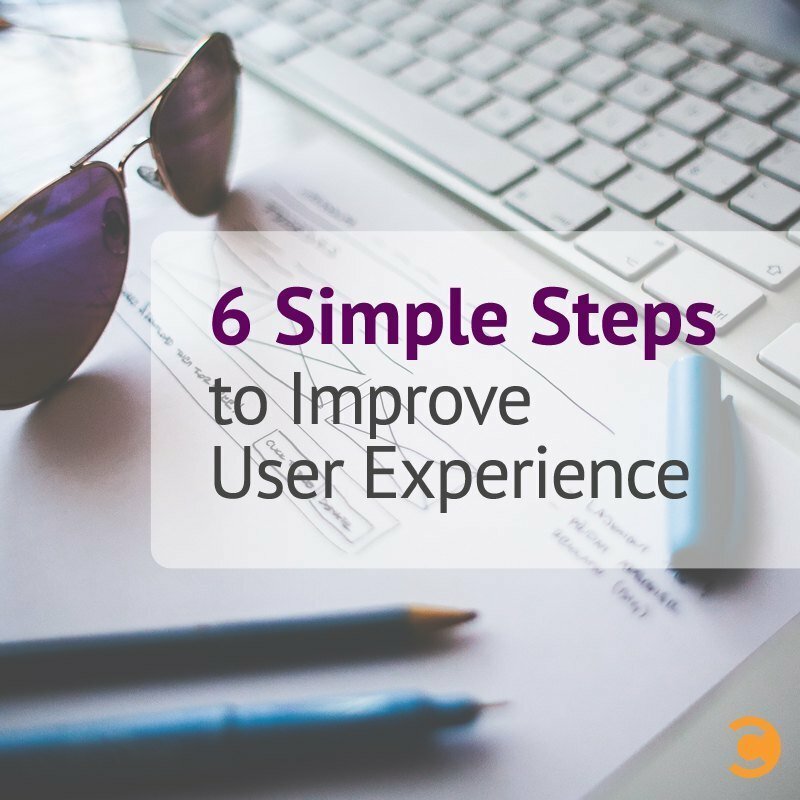 There’s a lot to say about how to better UX in every aspect of an organization, but the quick tips below will help you avoid common UX mistakes on your website, and instead, create a site that’s easy to use and provides an engaging experience for the visitor. Optimize images: Speed matters. Every fraction of a second a visitor waits for your site to load, their frustration grows—and that frustration is aimed at your brand. Images account for a significant portion of that load time. Make sure you’re not making your visitors download a gigantic image that’s only being used as a tiny thumbnail. A website set up properly on a CMS will do this automatically for you, but if that’s not the case, there are plenty of free tools available that you can use to optimize your images before adding them to the site (JPEGmini, Smush.it, etc.). Automate speed improvements: Set up as many automated speed improvements as you can. If you use a CMS, install a plugin that will cache parts of your site so that visitors don’t need to download anything more than once. WP Super Cache or W3 Total Cache are great if you use WordPress. These plugins can also minify and compress files, making file sizes significantly smaller and allowing visitors to browse your site more quickly. Some of the more technical aspects of caching and compressing files may require a web development partner. Avoid stock photos: Cheesy stock photography is the quickest way to turn a great site into a mediocre one. The typical user can spot a stock photo from a mile away, and it instantly devalues your website. If you’re looking for a photo to use on your “Contact Us” page, try a picture of your actual team rather than using the same stock photo of a woman wearing a headset that every one of your competitors uses. Protect your brand: So you ran an A/B test and found that the garish neon green button converts better than the on-brand accent blue used consistently throughout your site. Is a 1 percent increase in conversions really worth the damage that eyesore will do to your brand? A/B testing is great, but keep in mind that the design affects more than what people click—it affects how they think about your company. Be clear: Find a way to distill what your business does down to a clear, concise statement, and lead with that. There’s a time and place for mystery and intrigue, but the main headline of a business website is not it. Visitors shouldn’t have to read the entire site to figure out what your business does; they should be able to understand what you do within a couple seconds of landing on your homepage. A few well-written pages will be infinitely more effective than dozens of poorly-written ones. Well-placed calls to action: Tests have shown that a call-to-action button performs best at the point in the page where the visitor also finds the information they need. Rather than plastering calls-to-action throughout the site and bombarding visitors at every turn, use a more strategic approach and place the button at the point where the visitor is prepared to make a decision. Oftentimes, we get so caught up in ensuring that our websites appear in relevant searches that we forget how important it is to ensure that once customers and partners do arrive at our website, we are giving them the best possible experience. These tips should get you on your way.